All eyes will be on the Mother Goose Stakes today at Belmont Park, where the heavily favored Dreaming of Julia looks to rebound after her disastrous trip in the Kentucky Oaks. However, from a betting standpoint, the day’s most interesting Graded contest takes place at Colonial Downs. Adjacent is lightly raced for a seven-year-old, with only 10 career starts, but she’s in great form. Her last two speed figures, 107 and 106, are both higher than any figure earned by her six rivals during 2013. She is very good value at her 5-1 morning line price. With other speed horses drawn inside of her, Adjacent will need to work out a trip from her outside post, but her rider, Jose Lezcano, is one of the best around on turf so should find a way to draw the best from her. For exotic wagering purposes, opposing 7/5 morning line favorite Channel Lady in the underneath slots is a risk that could pay off. She will concede 6 lbs to a trio of rivals who have very competitive figures. Channel Lady is a Pletcher-trained horse who made three starts at Gulfstream Park over the winter. Historically, Pletcher horses who compete regularly through the Gulfstream Park meet struggle to reproduce their form in the summer. Win bet on Adjacent. 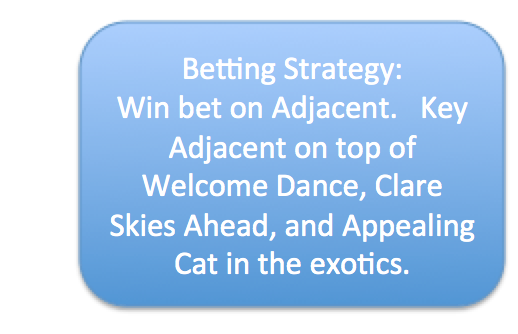 Key Adjacent on top of Welcome Dance, Clare Skies Ahead, and Appealing Cat in the exotics. The Colonial Turf Cup has attracted a field of eight runners, with Air Support the favorite on the morning line. He finished second in this race last year and has the credentials to go one better. However, the feeling here is that given his recent speed figures, which do not stand apart in this field, the value lies in playing against him. For a horse who has done some of his best running at nine furlongs and has never run farther than that, Swift Warrior sure does inspire a lot of talk about his distance limitations beyond nine furlongs. Indeed, even his owner has engaged in it. Perhaps today is the day when some on-the-track evidence will be added to all the negative speculation about his distance capabilities. Or perhaps the Giant’s Causeway in his pedigree will see him through. In any event, at 7-2 on the morning line, Swift Warrior is the selection. His speed figures are a match for those of any horse in this race. He is a paragon of consistency. He has a top trainer. His favorite rider is back in the saddle. He should be in line for a nice stalking trip. If he handles the distance, he figures to be hard for his opponents to handle. Atigun should welcome the drop back from 12 furlongs and is a big, if obvious, threat to win the race and a must-use in exotics. For those shopping for a big price, the front-running Two Notch Road figures to clear off from this field early (see the pace projector on the TimeformUS Preview Page) and has run speed figures in the past that would put him up with the best of these.